I’ve been a wee bit obsessive about hand printing lately. 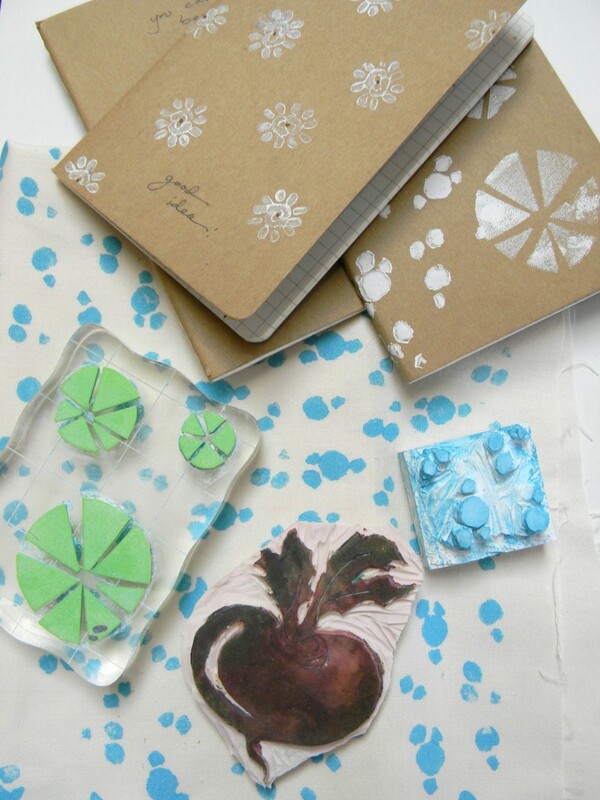 it probably started back when we did the stamping art project with the kids for valentines day. but, it became urgent (URGENT!) when I bought three little kraft paper covered moleskin books. it’s not the kind of thing I normally buy, moleskins seems like such an indulgence. but, I kept having ideas that I was certain I would remember and didn’t need to write down…well, you know how that story ends. so, I caved and bought these little books that will fit anywhere, anytime. the moleskins are filed with graph paper and the combination of a kraft paper cover and graph paper interior was like some kind of kryptonite. I was too weak to resist. 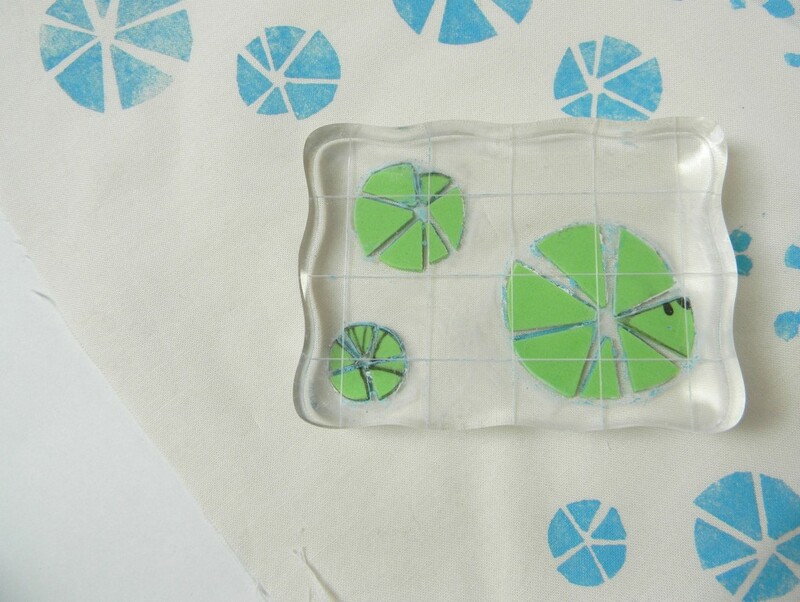 my favorite was actually this ‘lily pad’ design..made by cutting a foam sheet and gluing it to the clear stamp base. I bought the clear base literally years ago and never used it, waiting for the ‘right’ project. but, in line with my 2013 goals I pulled it out and just used it. my habit of saving nice things is so, so ridiculous and slowly but surely it is a habit I’m breaking. I’m pretty sure the clear base is a martha stewart product. I really, really like it. because the stamp is clear I can see exactly what I’m doing and line everything up well. I’ve used wood bases before and it’s so much more difficult to line things up just right when you can’t see what you are doing. I especially wanted to be able to see what I was doing with this stamp because I didn’t print the repeat in a conventional way. instead, I bounced around, deciding which direction to place the stamp as I went. it made it so easy to create a one-of-a-kind design with some flow. the picture above was just my practice/playing around effort. I promise to share more finished projects soon. but, the moleskins books really are making me happy. I used regular old white tempera paint, actually stolen from the kids art cabinet. (in case you are curious, I did use fabric paint for printing on the fabric.) I’m already using the moleskins, I keep one in my purse. I named my favorite one. it’s called “good idea!”. because, you know what? I noticed something. I am excellent at recognizing when I’ve been a terrible parent and have done everything wrong; I do a great job of berating myself over a sewing or professional failure; I even excel at noting when I’ve been an impatient friend or wife. but, I’m not nearly as good at allowing myself the compliment of a good idea. so, this is my good idea book. even when I glance over at it; it says to me good idea! it’s going to fill up with good ideas…even the bad ones will be good ones in this book. I’m starting to think I should have always carried a good idea book. 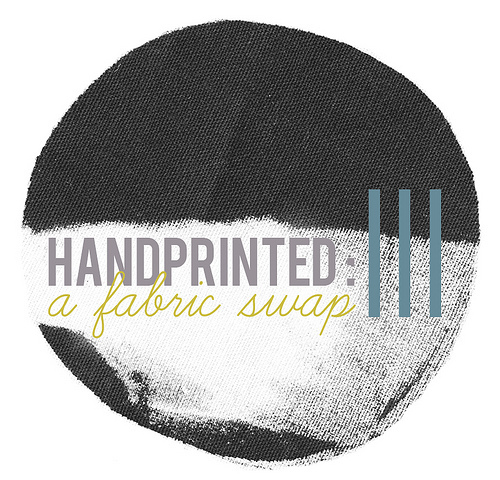 speaking of good ideas, I took my renewed hand printing enthusiasm and joined in a fabric swap at maze and vale. it is hosted by the inspired and lovely leslie keating and she has been so gracious, providing tons of inspiring hand printing tutorials. I’m so excited. 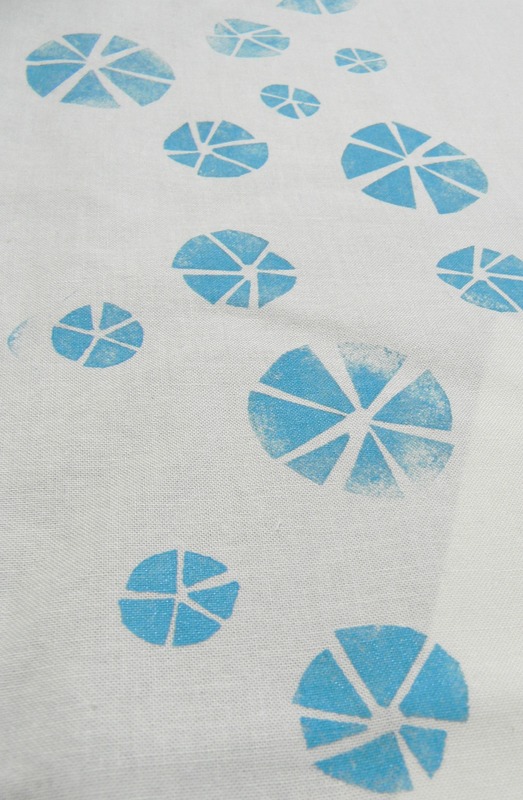 can’t wait to make something beautiful and unique with the hand printed fabric I receive. 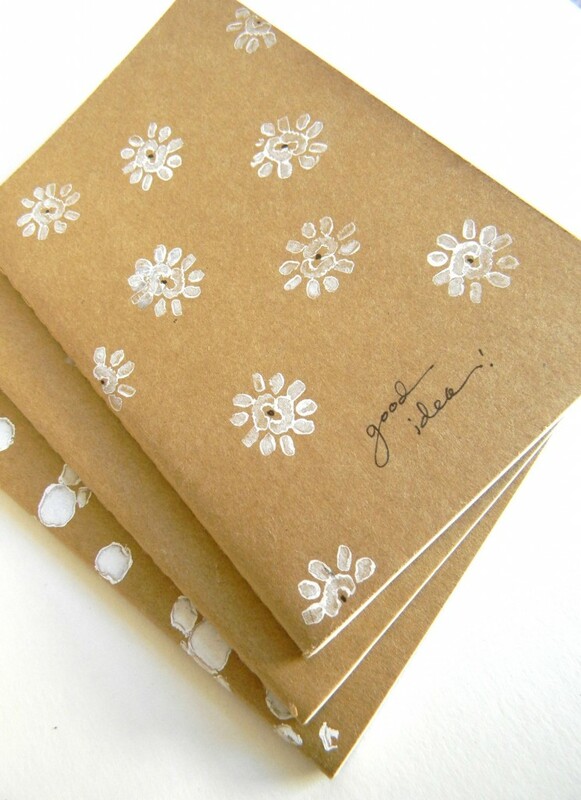 what a great idea – to have a ‘good idea’ book. i am forever looking at what i can improve about myself, but that can certainly be turned from a negative into a positive. cute printing too. i have recently tried my hand at printing, and i am loving it. i just joined up with the fabric swap you posted about – thanks for the tip. Thanks for the kind words. Yep. We gotta remember to pat ourselves on the back! So glad you signed up for the fabric swap, it looks fun doesn’t it! I’m excited. This looks so fun, love the beet! Nice work! Thank you. I love hand printing so much. Should do a salon on hand carving a stamp, etc. That would be fun.